They Walked to Conquer Cancer Again! We all have a story to tell about at least one special someone who has received the terrifying diagnosis of cancer. In April, I posted a story about my daughters, Lisa and Jenna who formed a team to participate in the 60 kilometer (a little more than 37 miles) Walk to End Breast Cancer in support of research at the Princess Margaret Hospital in Toronto, Ontario. They raise funds and walk because breast cancer took their mother from them when they were just teenagers. It hadn’t been the first time that Karen had found a small lump in a breast. The first time had occurred in our second year of marriage. At that time, the benign lump had been removed and Karen had been told not to worry as some people were just prone to these small ‘cysts.’ In August 1999, twenty years later, another small lump was found. A mammogram indicated that there was again nothing to worry about and that further medical intervention was not needed “except for the patient’s peace of mind.” With no ‘peace of mind’ and as only worry was being felt, surgery was scheduled to remove the lump. On December 20, 1999, Karen and I returned to her surgeon’s office full of expectations to be told all was well. Her surgeon entered the small office where we waited, sat down beside Karen and uttered the life changing words, “I’m afraid I don’t have very good news for you.” Karen passed away in 2002 after a brave battle with an aggressive form of cancer. Lisa and Jenna formed the team ‘Karen’s Wings’ to raise funds by completing a marathon type two day walk through the streets and neighbourhoods of Toronto. In the past two years, their team has raised about $14,500 to fund leading edge research that is inching closer to a cure. This past weekend, 4,633 cancer survivors and their supporters hit the streets and walked again. The oldest walker was 97 years young ‘Kitty’ and the youngest survivor, a 4-year old girl who has already experienced the trauma of a double mastectomy. Below, Lisa and Jenna cross the finish line at the Canadian National Exhibition grounds to the cheers of many gathered there to offer encouragement and congratulations. 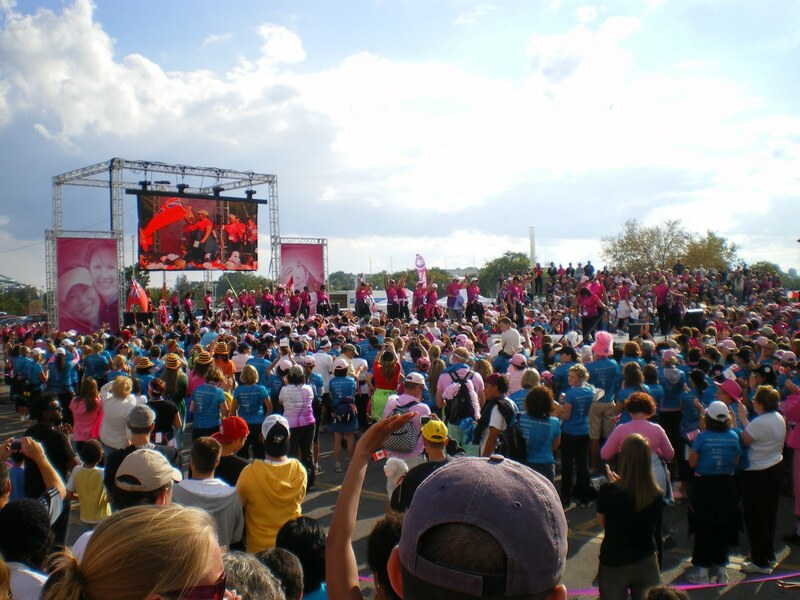 The closing ceremonies allowed all participants, including the survivors shown below wearing their pink survivor shirts entering the ceremonies across the stage, to celebrate their achievement – this year raising $10.6 million to further the Princess Margaret cancer research work. Next year, we plan to expand the Karen’s Wings team with the addition of my son John along with my wife, Ellen and myself (assuming doctors okay the participation of us ‘old folks’). Our real hope, however, is that we won’t need to walk because cancer will have been beaten! ← I Could Have Been Rich! I'm so sorry for your loss, Ian. But how proud you must be of your two daughters for their efforts in helping to beat this terrible disease! May the rest of your family remain cancer-free. As you said, I also hope that further walks are not needed.